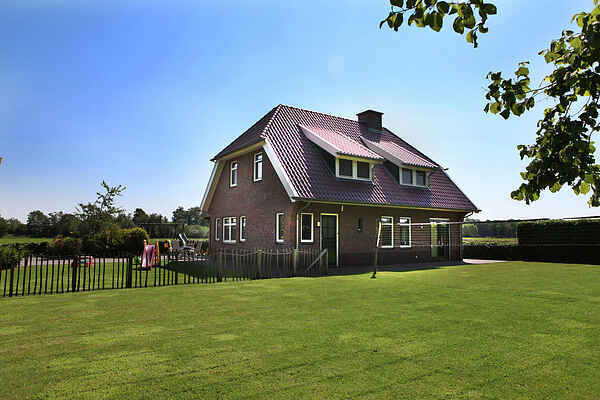 This new farm (2006) is located in the Gelderse Achterhoek and has a wide and beautiful view on the pastures. The apartment is very comfortable and has a lot to offer children too like a play attic with table tennis, table football and shovelboard. There is also a volley court and a boules lane near the house. In Neede you can walk and cycle for kilometres on end. You will find the most beautiful nature areas here with beautiful forests and authentic farms. The region offers many recreational opportunities: sub-tropical swimming pools in Neede and Haaksbergen, recreational lake in Hambroek (7 km), fun museums and play and pancakes farm "Erve Brooks". There are no steps in the apartment, all rooms have wide doors and there are two bedrooms on the ground floor.